In order to achieve our goal of 80% third-grade reading proficiency by 2025, Read Charlotte has established a Transformation Fund to promote innovation, collaboration, and seed new programs addressing unmet early literacy needs in Charlotte-Mecklenburg. The Transformation Fund is not designed as the single source for early literacy funding. Read Charlotte will also strive to advise area funders on strategic co-funding opportunities. The Transformation Fund will provide grants that align closely with the Read Charlotte mission and strategic plan. We seek projects or programs that support strategic transformations in early childhood language and literacy development and show potential for success based on research or evidence that directly links the strategy to improvements in one or more Read Charlotte community indicators. Grants may support initiatives to help existing organizations be more innovative, collaborative or data-driven; and/or seed new programs to meet crucial gaps or unmet needs along the birth through third-grade continuum. We are committed to funding solutions, not problems, which will help achieve the 2025 goal. Read Charlotte will make a limited number of grants using a combination of “negotiated” and competitive grants. Competitive grants will be offered, as needed, to source solutions to a specific problem identified by Read Charlotte. We do not seek, accept or fund unsolicited grant applications. Seed capital and/or early-stage funding for pilots of innovative solutions to early literacy challenges. Projects or programs may advance knowledge or innovation where high-achieving, successful models and/or providers are lacking, or test new approaches to outperform existing practices. Capacity building/expansion of proven approaches where impact is greater than one organization. Note: Letters of support or joint proposals may be required. Fostering collaboration across more than one organization or a broad group of people. Grants considered may include projects with multiple players involved and/or no clear lead organization. Data collection, management, analysis, reporting, and coaching to support implementation of Read Charlotte strategies or broad community infrastructure. Focus on children from birth to five years old. Focus on Kindergarten and first grade achievement. Provide opportunities to share, learn and act across organizations. Demonstrate measurable outcomes that connect to one or more Read Charlotte community indicators. Include multiple sources of funding and/or provide opportunities to leverage other funding sources in addition to the Transformation Fund. Achieve or have the potential to achieve significant scale across Mecklenburg County. Allow for the most impactful use of limited dollars. Applicant organizations may be for profit, nonprofit with a 501(c)(3) tax designation in good standing, or qualified governmental, educational or religious organizations. A nonprofit organization without a 501(c)(3) tax designation may also be considered if it has an eligible fiscal agent organization. Organizations must target residents or provide services in Mecklenburg County. Requests must include measured outcomes that tie to a Read Charlotte indicator. Opportunities for capacity building, training, or convening will be considered if the outcome will enhance collaboration across multiple organizations. Stand-alone research, professional development, arts, travel or conferences projects or programs. Requests of this type may be considered as components of a larger, collaborative project. General operating support or fund-raising activities and/or programmatic or operational needs of a single organization. Requests that are not directly related to early language and literacy outcomes (birth through third grade). Multi-year commitments, however grantees may reapply for funding. The Read Charlotte Grant Committee will review both negotiated and competitive grant applications and make recommendations to the full Governing Board for approval. The committee will consist of 5 members: 3 funders and 1 community representative from the Read Charlotte Governing Board and 1 member of the Read Charlotte Working Groups. The Grant Committee will rotate on an annual basis. Members of the committee will be nominated by the Read Charlotte Executive Committee and approved by the full Governing Board. 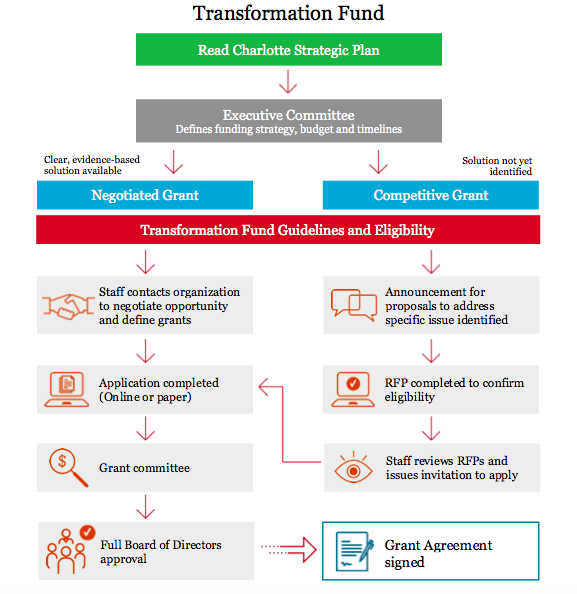 If a member of the Governing Board is associated with an organization that may request funding from the Read Charlotte Transformation Fund, they are not eligible to serve on the Grant Committee. Organizations that are represented on the Grant Committee are not eligible to apply to the Transformation Fund. “Represented” means that an employee or substantial volunteer (member of a governing or advisory board) is a member of the Grant Committee. In situations where clear, evidence-based solutions to a proven need are identified, Read Charlotte may work with organizations to provide a negotiated grant. Read Charlotte staff will lead evaluation and recommendation of negotiated grants. They will also partner with organizations to define the grant specifics. A grant application will be submitted for review by the Grant Committee and approval by the full Governing Board. Negotiated grants will be made on an as-needed basis. Interested organizations will have the opportunity to complete an initial Request for Proposal (RFP) to confirm eligibility. Read Charlotte staff will review the RFPs and invite selected organizations to apply. Applications will then be reviewed by the Grant Committee and final recommendations approved by the full Governing Board. Grant evaluation reports may be required. Deadlines will be determined at the time of the grant award. Note that negotiated grants may require additional data sharing and/or progress reports for the life of the grant. All Read Charlotte grants will be made public through a variety of communication mediums including website, social media, public media and annual reports. Site visits may be conducted at any time during the grant period. Generally, grant awards will be $100,000 or less. However, the Grant Committee and Governing Board may consider grants above this level based upon such factors as: complexity, nature of the project, expected impact, number of collaborating partners, average budget size of partners, etc. Final determination will be made by the Governing Board.